"Control Screen Brightness From Any App"
What is Brightness Rocker and why might I want it? 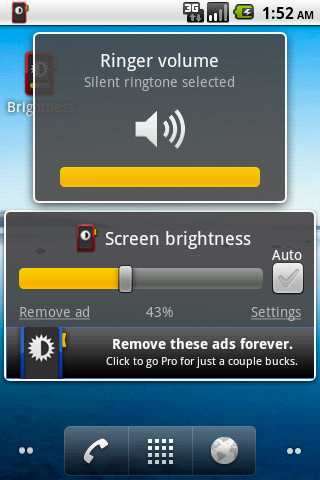 Brightness Rocker empowers you to control your screen's brightness from any Android app. Just press the volume rocker buttons to display a brightness slider (in addition to changing the volume). Alternatively, you can use the Brightness Rocker home-screen widget or notification icon to view and change screen brightness. What versions of Android does Brightness Rocker work with? 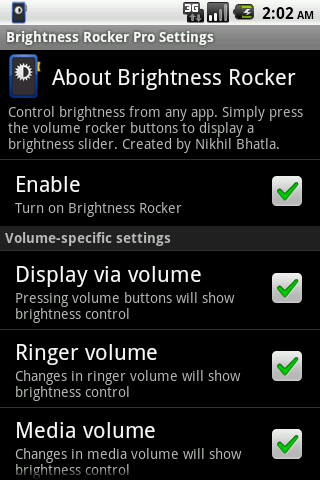 Brightness Rocker will run on Android 1.5-2.2. 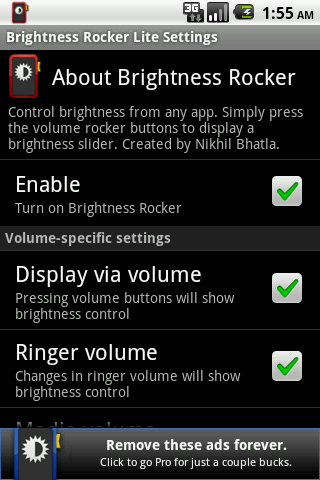 Brightness Rocker is optimized for Android 2.2 and works best there. It also works with Android 1.5-2.1, but has several issues. First, it can take several seconds to appear after the volume pop-up has disappeared. Second, you actually have to change the volume to trigger it - if the volume is maxed out and you just click up on the volume rocker, it will not show the brightness control. Note that the notification icon and home widget work normally in 1.5-2.1; it's just the volume rocker triggering which isn't as good as in 2.2. What Android phones does Brightness Rocker work on? G1 (Android 1.6 Donut on T-Mobile) - volume rocker is slow to display brightness control. HTC Aria (2.1 Eclair on AT&T) - volume button is slow to display brightness control. HTC Evo (2.2 Froyo, 2.3 Gingerbread, Fresh ROM on Sprint) - no known issues. HTC Incredible (2.2 on Verizon) - no known issues. Motorola Droid (2.2 on Verizon) - no known issues. Motorola Droid 2 (2.2 on Verizon) - no known issues. Motorola Droid X (2.2 on Verizon) - no known issues. 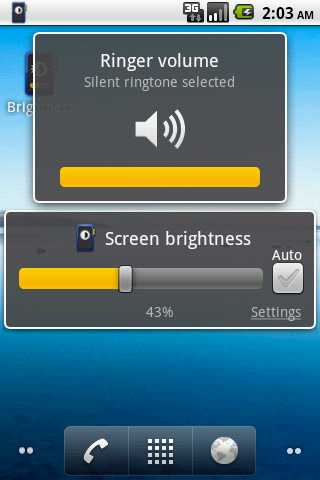 Samsung Galaxy 5 (2.1) - volume rocker is slow to display brightness control. LG Ally (2.1 on Verizon) - volume button is slow to display window; auto brightness checkbox may not be visibile. Samsung Fascinate (2.1 on Verizon) - volume button is slow to display window; notification icon and widget don't work properly. Integrates with Android's built-in automatic brightness feature, so you can switch auto brightness on and off easily via the brightness pop-up. A checkbox is located to the right of the manual brightness slider. Integrates Google Adsense for Mobile Apps (AFMA) as a new ad provider in the Lite app, in addition to AdMob and MillenialMedia (mixed via AdWhirl). Misc. bug fixes, including fix for hanging on install. Update that disables "in-call volume" setting by default. Some visual voicemail applications will pause when the brightness slider gets displayed when you're trying to increase the call volume. This is annoying. Existing users will still need to uncheck "in-call volume" setting after upgrade, but new users will have it unchecked by default. What permissions do I give the app when I install it? Brightness Rocker requires various permissions primarily to improve the user experience and to help eliminate bugs. Secondarily, the Lite version requires certain permissions to provide more relevant advertising. Details are provided below. If this is a concern for you, don't hesitate to email me (android@superfacts.org) to let me know. Who helped in the making of this app? Special thanks to Dave and Jude for getting me an Android programming book for my birthday, Nick for lots of testing with Android 2.1, my Android buddies for late-stage beta testing, and Becca for putting up with me.